Nicknamed “snowpocalypse” and “snowmageddon,” an exceptionally severe winter storm dropped several feet of snow around the Washington, D.C., area in early February 2010. Crashed and abandoned cars littered roads as airlines canceled hundreds of flights. Even the DC Metro train system stopped functioning in places. 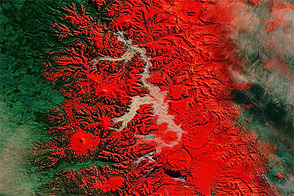 The Moderate Resolution Imaging Spectroradiometer (MODIS) on NASA’s Terra satellite captured this true-color image on February 7, 2010, showing part of the region affected by heavy snowfall. 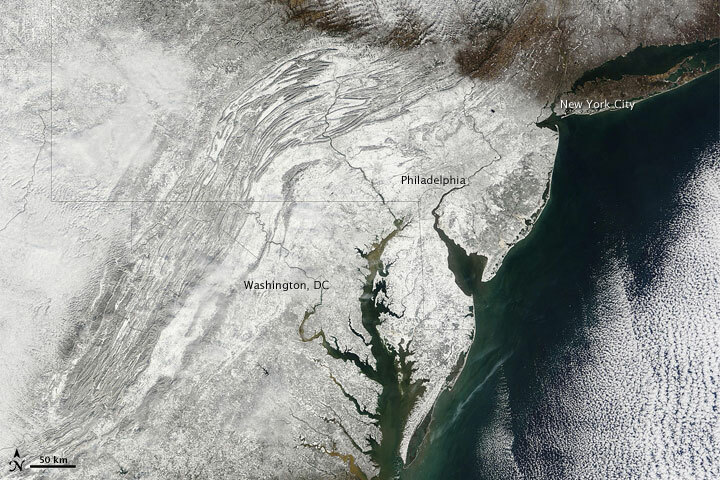 Snow blankets the area hundreds of kilometers inland from the Atlantic coastline. 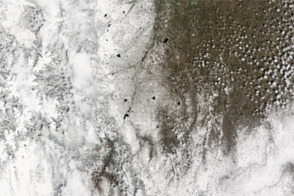 Along the latitude of New York City, however, snow cover thins considerably. Authorities urged residents to stay indoors, but hundreds of thousands lost electricity. The Washington Post reported that the snow-induced standstill might last until midweek, especially if a second winter storm arrived as predicted on Tuesday. As of Monday morning, government offices remained closed, and many streets remained unplowed. 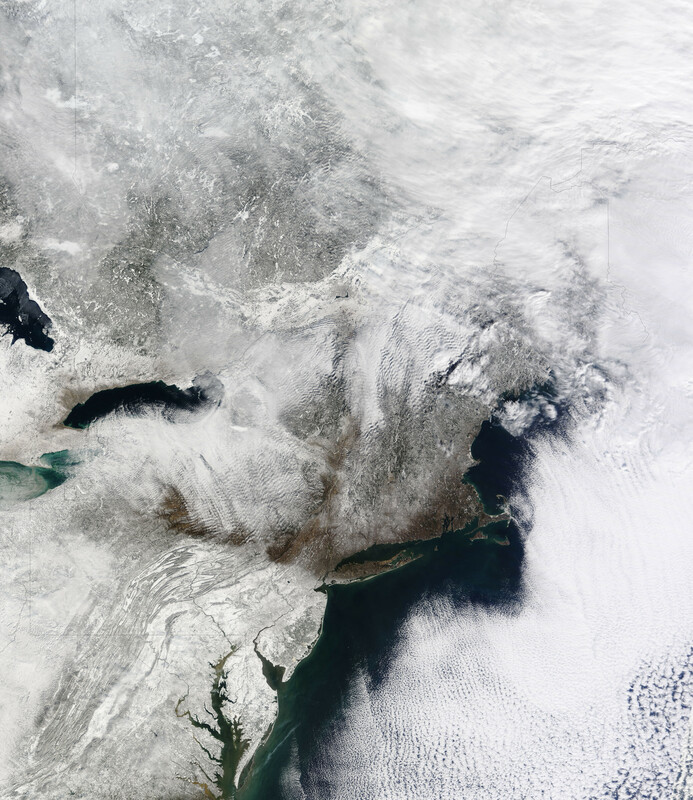 Acquired February 7, 2010, this true-color image shows snow blanketing much of the U.S. East Coast. 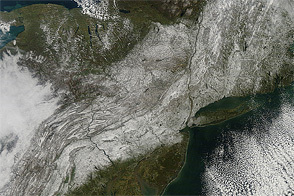 Snow extends hundreds of kilometers inland from the Atlantic coastline, but thins near New York City. The Washington Post. 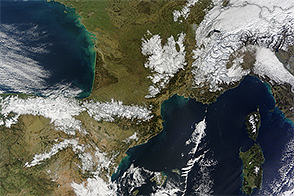 (2010, February 7). Washington area news. Accessed February 7, 2010. 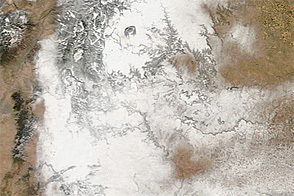 Harris, P. (2010, February 7). Snowstorm brings US capital to a halt. The Observer. Accessed February 7, 2010.